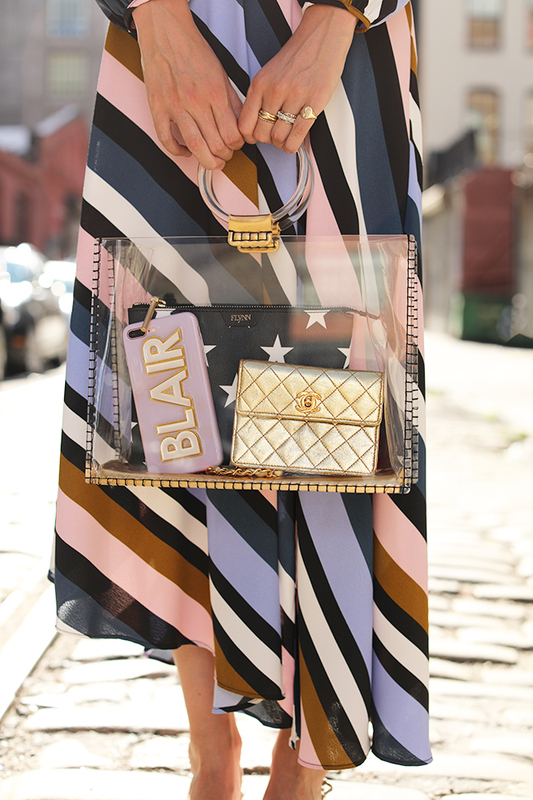 Combining all of my favorite things: stripes, a great midi length, pom poms, stars, hearts, and, of course, Chanel! I love eclectic looks and a bold color palettes, so this ensemble was a clear winner in my book #allofthethings. When I spotted this dress for under $100, I knew it would be a great transitional piece. It is lightweight enough for the end of summer heat, but also com fall, will look amazing with saddle colored booties and an overcoat. I paired it with these pom pom kitten heels that I snagged on sale and this clear bag I had been waiting to pull out of my closet for just the right outfit. Shop the full look below (including my new favorite personalized phone case), as well as my top five items from the #nsale. Don’t wait, the sale that ends today! Stripe dress (also in a yellow polka dot) – see my other favorite under $100 finds here. Heels: Aquazzura (on sale, I am also eyeing these pink pom pom heels). Phone Case: Bauble Bar. Stars Pouch: Flynn. Chanel Bag, Vintage. Headband: Lele Sadoughi. Sunglasses: Saint Laurent. Clear bag. You can see my full post covering the sale here, but knowing prices go up tomorrow, I wanted to highlight five of my favorites that are still in stock! ONE // The sweetest sweater. This sweater is a great, feminine fit, and the cashmere yarn is seriously soft. Lilac is at top of my list for must wear colors for fall, and this was my favorite purchase from the sale. TWO // My most worn leggings, updated! I am not much of a legging gal, but when I discovered these leggings, they changed my mind. When I saw that they were updated for the sale it was an easy purchase, as I know they will be worn again and again. THREE // A perfectly preppy shirtdress. As seen here, this shirtdress made its way into my closet in two colorways (also bought this plaid). The oversized bow, hint of stretch, and generous sweep make it more ‘wow’ than your average piece. FOUR // Quilted rainboots that are fall ready. If you have followed Atlantic-Pacific, you will know I LOVE a great wellie (as seen here, here and here). Hunters can be hard to find on sale, so this is the perfect chance to pick them up for less. FIVE // A teddy bear moment. While I need a new coat like I need a hole in my head, this one caught my eye. It is available in a more classic tan as well as lilac (yay!). This cozy, oversized piece almost has me ready for fall. You are insanely stylish here! This stripe dress is so perfect! The dress is so pretty. The colorful stripes are a lovely pattern. Thanks for sharing, always sharing great posts! Yay for the coat fetish! I can never say no to a new coat! The colour combo of these stripes is just so pretty! I love the dress but the see-through bag is SO cool!! Great post! This is a gorgeous piece you have on and the little headband is adorable! Love it! Honestly ADORE that dress! The colours are so beautiful! I really like the strip dress you wearing and the hair band you wearing. Gorgeous! And of course – the shoes!!! Beautiful dress and I love the accessories! Looking amazing.